Laser treatment may sound intimidating to many but in reality, it’s a perfectly safe and painless procedure. Making the most of modern technology, it uses precise equipment to provide a level of treatment that would be all but impossible when done traditionally. Although widely used by specialists in the US, Pure Periodontics is the ONLY specialist periodontics practice in central London to offer the Waterlase MD Turbo technology. Deep Pocket Therapy is a highly effective, more aesthetic and comfortable alternative to traditional surgical procedures for patients. The Waterlase MD Turbo YSGG laser is a true all-tissue laser. It is intended for use on soft tissue, bone and tooth structures. This therapy changes the environment in the gum pocket through removal of inflamed tissue and root surface calculus/tartar to promote healthy tissue regeneration. It offers patients a minimally invasive option for many procedures. For enhanced clinical results, unmatched versatility, and technological superiority, the Waterlase MD Turbo YSGG laser is the proven treatment choice. A periodontal treatment probe is put into place to measure the depth of the bone loss. Pulsed light is used selectively to treat the diseased tissues inside the pocket and to remove infected areas. Due to the precision of the laser, healthy tissue is left completely unharmed. Using special scaling methods, tartar is removed. Thanks to the effects of the laser, the removal is easier than it would be during a traditional scaling. A different intensity light is used during a second phase of laser gum treatment. It would cause a fibrin clot that will connect the gum to the root surface. A fibrin clot is created at the pinnacle of the gum by pressing the tissue against the root surface. The patient’s bite is adjusted so that teeth do not clash or traumatise each other whilst they’re in use. They are also given a night guard to ensure an optimised healing process and the long term success of the procedure. Special dietary recommendations might also help to ensure lasting success. What are the benefits of laser periodontal treatment? 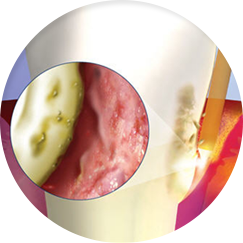 Many periodontal lasers use heat to cut tissue. This treatment combines a laser with a blast of water to slice tissue and bone without heat. The biggest benefit is that it causes blood vessels to get sealed much quicker, greatly reducing sensitivity to the discomfort that the treatment may call. Deep Pocket Therapy using the Waterlase MD Turbo laser is one of the least invasive removal methods for inflamed tissue and deposits in the pockets. It is a therapy used to moderate severe and advanced cases of periodontal disease, promoting ligament reattachment to the root, even in the absence of long junctional epithelium. The Waterlase MD Turbo has been cleared by the FDA and research supports the success of the 2,780 nm YSGG wavelength as an effective laser periodontal treatment. Unlike many traditional lasers used in periodontal treatment, the Waterlase MD Turbo laser is a true all-tissue laser. It is supported for use on soft tissue, bone and tooth structures, because it’s very versatile. Most laser treatments for diseased gums involves slicing tissue using heat-based energy. The Waterlase MD Turbo uses YSGG laser energy and a burst of water to slice soft tissue and bone without heat, with added benefits such as less swelling and less sensitivity after the operation, for a better patient experience and a higher rate of case acceptance. When placed in soft tissue mode, the 2,780 nm Er,Cr:YSGG Waterlase MD Turbo laser energy penetrates into the tissue to seal blood vessels as it cuts, providing excellent hemostasis, which in turn provides you with a better field of vision during surgery. The sensitive nature of the Waterlase MD Turbo YSGG laser can help minimise tissue displacement and flap preparation in osseous crown lengthening during a laser treatment for gum disease. It aids in carrying out an externally beveled gingivectomy, moulding the free gingival margin, troughing, and recontouring and smoothing the bone. To find out more about laser treatment please call us on 020 7247 7400 to speak with our friendly team or fill out our contact form.